The GaN power device market was valued at USD 327.3 Million in 2016 and is expected to reach USD 1,890.2 Million by 2023, at a CAGR of 29.1% during the forecast period. The base year considered for the study is 2016 and the forecast period is between 2017 and 2023. The objective of the report is to provide a detailed analysis of the market on the basis of device type, voltage range, application, vertical, and geography. The report also provides information regarding the major factors (drivers, restraints, opportunities, and challenges) influencing the growth of the GaN power device market, along with the detailed value chain. In addition, the key players for GaN power device are strategically profiled, and their market rank and core competencies are comprehensively analyzed, along with detailing the competitive landscape for market players and describing the product launches, product developments, acquisitions, partnerships, expansions, agreements, and collaborations in the market. The GaN power device market comprises business entities such as Cree (US), Qorvo (US), MACOM (US), Microsemi Corporation (US), Analog Devices US), Efficient Power Conversion (US), Integra Technologies (US), Transphorm (US), Navitas Semiconductor (US), Texas Instruments (US), Sumitomo Electric (Japan), Northrop Grumman Corporation (US), Qromis (US), Polyfet (US), TOSHIBA (Japan), Sumitomo Electric (Japan), Mitsubishi Electric (Japan), Panasonic (Japan), GaN Systems (Canada), VisIC Technologies (Israel), GaNPower (Canada), Infineon (Germany), Exagan (France), Ampleon (Netherlands), and EpiGaN (Belgium). The GaN power device market is expected to reach USD 1,890.2 Million by 2023 from USD 408.3 Million in 2017, at a CAGR of 29.1% between 2017 and 2023. 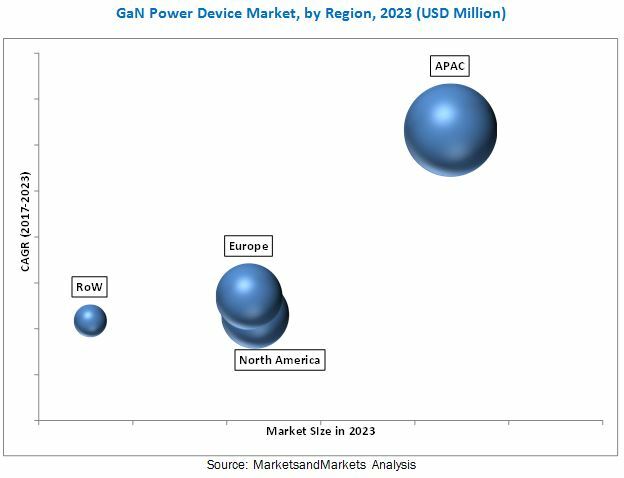 The major factors driving the growth of the GaN power device market include huge revenue generation from the consumer electronics and automotive verticals, wide bandgap property of GaN material encouraging innovation, success of GaN in RF-power electronics, and increasing adoption of GaN RF power device in military, defense, and aerospace verticals. The market for RF power devices held the largest market share in 2016. The need for high power in the very high frequency (VHF), ultrahigh frequency (UHF), and microwave bands has led to the demand for these devices, which can supply tens to hundreds of watts at RF frequencies up to 10 GHz and beyond. Most of these devices are made from GaN. Initially developed for improvised explosive device (IED) jammers in Iraq, GaN RF power has emerged as the technology of choice for all new microwave and millimeter-wave electronics including radar, satellite, communications, and electronic warfare. The market for GaN-based power drives is expected to grow significantly during the forecast period. This is attributed to its characteristics such as high breakdown voltage and low conduction resistance characteristics that enable high-speed switching and miniaturization. Moreover, the large total addressable markets such as power distribution systems, industrial systems, heavy electrical systems, turbines, heavy machinery, advanced industrial control systems, and electromechanical computing/computer systems, as well as several new power applications (clean-tech) such as high-voltage direct current (HVDC), smart grid power systems, wind turbines, wind power systems, solar power systems, and electric and hybrid electric vehicles are among the prime reasons for its faster growth. Asia Pacific (APAC) is expected to hold the largest share of the GaN power device market during the forecast period owing to the growing demand for power devices in the industrial, computing, telecommunications, automotive and military, and aerospace and defense verticals in emerging Asian countries such as China, Japan, Taiwan, the Philippines, and India. Moreover, the EV charging and electric vehicle production markets, as well as increasing renewable energy generation are driving the growth of the market in APAC. APAC held the largest share of the overall GaN power device market in 2016 owing to the growing demand for these devices in numerous applications such as industrial, computing, telecommunications, consumer and enterprise, automotive and military, and aerospace and defense in Asian countries such as China, Japan, Taiwan, the Philippines, and India. However, competition from silicon carbide (SiC) in high-voltage semiconductor applications is expected to be one of the key factors restraining the market growth. Dominant players in the GaN power device market include Cree (US), Qorvo (US), MACOM (US), Microsemi Corporation (US), Analog Devices US), Efficient Power Conversion (US), Integra Technologies (US), Transphorm (US), Navitas Semiconductor (US), Texas Instruments (US), Sumitomo Electric (Japan), Northrop Grumman Corporation (US), Qromis (US), Polyfet (US), TOSHIBA (Japan), Sumitomo Electric (Japan), Mitsubishi Electric (Japan), Panasonic (Japan), GaN Systems (Canada), VisIC Technologies (Israel), GaNPower (Canada), Infineon (Germany), Exagan (France), Ampleon (Netherlands), and EpiGaN (Belgium). 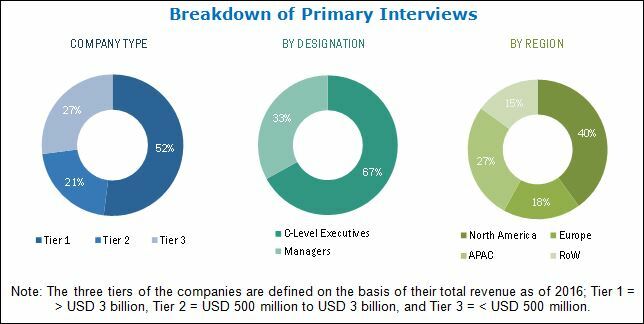 These players adopted various strategies such as product developments, acquisitions, partnerships, expansions, agreements, and contracts to achieve growth in the GaN power device market.